When activated, Michael becomes Asset 108, a cyberenhanced human who stands against the strange darkness that lurks at the edge of our world. Armed with equipment that most would find impossible to comprehend, he is sent on missions both strange and deadly. Each dossier pits him against irrational creatures and beings - most with the power to unravel his sanity or reality itself. It's never a simple job. The adventure comes to audible! 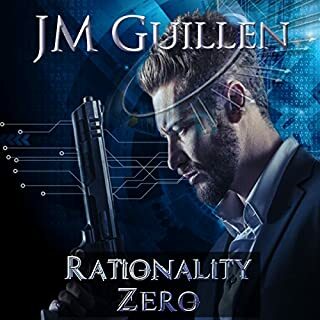 JM Guillen will take you on a wonderful adventure through the veil of Rational space. 'Rationality Zero' is a tangling tale of well-choreographed combat, subtle intrigue, Booby Traps, futuristic technology, and video game-like abilities. It reeled me in and wound me tight with quips and jokes and serious moments. It’s worth a listen thanks to the narrator, whose depiction of the characters is clean and consistent! I will definitely be picking up the entire series.